As promised earlier, I'm now going to show you some examples of reoccuring images and motifs in Isao Takahata's career. We do see riffing on occasion, though nowhere near the frequencey of Miyazaki's work. 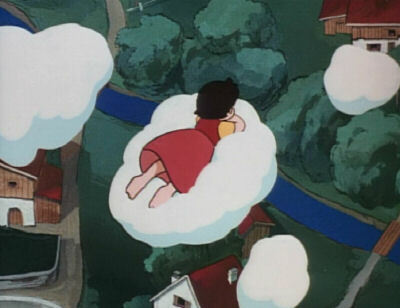 For Takahata, this technique is used as homage to his earlier works like Heidi and Panda Go Panda, though it is also employed as a dramatic means of comparing works. The opening sequence of My Neighbors the Yamadas, for instance, is heavily based on the title sequence for Jarinko Chie. This is a way of informing the audience as to the sort of movie that awaits them. Today, we'll take a look at Heidi, one of Takahata and Miyazaki's greatest achievements. This first shot comes from the opening scene for every episode. It's a terrific sequence, going from detailed pictures of the Alps, then moving to romanticized images of Heidi frolicking, swaying on a giant swing, bouncing on a cloud, and dancing ring-around-the-rosies with Peter. The shots with Heidi in the clouds are recreated in Yamada-kun, during another masterfully imaginative series of events. Here, in the second shot, we see the Yamada clan perched on a cloud as it descends onto the city, while an old woman dispenses advice for the newly-married couple (the advice - have lots of kids). A terrific scene.